We present the first documented case of an ectopic intramedullary hematopoietic niche within a cervical zygapophyseal joint intra-articular meniscoid. The meniscoid was identified in the cervical spine of an 81-year-old male cadaver, located at the dorsal aspect of the right C4-5 zygapophyseal joint, and was noted to be larger and more dense than other meniscoids during disarticulation and dissection of the joint. 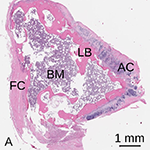 Histologically, the meniscoid contained hematopoietic cells surrounded by lamellar bone, and was lined with articular cartilage on the surface protruding into the joint cavity. Radiologically, the structure was hypointense on both T1- and T2-weighted magnetic resonance imaging sequences. The potential mechanisms underpinning development of this novel finding and the possible clinical implications are discussed in this report. FARRELL, Scott F et al. An ectopic intramedullary hematopoietic niche in a cervical spine meniscoid. Vascular Cell, [S.l. ], v. 9, n. 1, p. 3, dec. 2017. ISSN 2045-824X. Available at: <https://vascularcell.com/index.php/vc/article/view/10.24238-13221-9-1-173>. Date accessed: 25 apr. 2019. doi: http://dx.doi.org/10.24238/13221-9-1-173.